It has long been a dream of mine to just lay (lie?) in bed all day. All day, all night, just chillin’ there in my Spongebob pants. Well, my dream became reality, only it was a reality far too real to be fun. Saturday morning, about 9 a.m., I began to feel ill. By 10:00 I was in full-blown stomach virus meltdown. I made it to my bedroom and didn’t leave until just before this post. On Thursday and Friday our oldest daughter, Alicia, came to visit. She stayed in our bed, sick with whatever my wife and I both caught. Friday night my wife became ill, then I followed. But hey, there I was, over 24 hours in bed (except for the multiple trips to the toilet and the occasional cooling off time on the bathroom floor). You know the old saying, “Be careful what you wish for?” Well, be careful what you wish for. Laying (lying) in bed all day and night is no fun, especially when you can’t do anything. I couldn’t read, watch TV, listen to music, get comfortable, or even enjoy crackers and water. But I can say that spending all that time in bed sick as a dog (although I have never seen a dog so sick) reminded me of what is most important – not being sick. When one is puking his guts up, along with incurring the revenge of Montezuma, Facebook, WordPress, Twitter, texting, and any other form of modern communication is worthless. Relationships are even worthless if they are as sick as you are. The most important thing is to not be sick, unless you have other family who is willing to treat you like a spoiled baby and meet your every perceived need. Thankfully, after coming home from a youth outing Saturday night, our other daughters were able to see the humor in two adults in misery. Considering how this stuff is so contagious, I wonder how important they will think it was to make fun of mommy and daddy in a day or two? They’re just lucky they brought us jello and water when we asked. That was important, too. Years ago, when I was in Romania, I became similarly ill. Well, actually I was much worse, because that illness lasted for nearly a week – I almost died. Do you know what I was given to make me feel better? Green tea, white rice, and goat cheese. Sorry, but it didn’t help. Long story short, a U.S. Navy medic who was traveling with us agreed to find a carbonated drink (which ended up being mineral water with fruit syrup) and some bottle caps. We boiled some water, filled the caps, and snuck them into a tiny freezer. That night I had ice in my drink. American ingenuity – what a wonderful thing! It was in 1991 that tiny Moldova finally gained its independence from the Soviet Union. But Moldova has been traded back and forth for thousands of years between different tribes and nations. At one point Moldova was actually part of early Romania, but it was also controlled at different times by the Romans, the Huns, the Bulgarians, and the Mongols. If you remember last week’s country, Luxembourg, you will remember that she is one of the most wealthy countries in the world (per capita). Well, if Luxembourg is top on the money list, Moldova is right at the bottom. According to the European Parliament (via Wikipedia), Moldova is the poorest country in all of Europe in terms of GDP. And despite their economy growing in the last few years, the per capita GDP is only $2022.! To put that in perspective, the United States’ per capita GDP is $48,400, while Luxembourg’s $115,000! 20% of the population lives at or below the absolute poverty line of $2.15 a day. According to one of the only sources I am using today, most of the people in Moldova are Christian (93.3%). The only problem with that number is that most are either Russian or Romanian Eastern Orthodox. It is said that the church is so affected by culture and national interests that professing atheists (0.4%) participate in religious activities simply because it’s the thing to do. My concern is that there may be the ability to know the truth of Christ within the churches of Moldova, but do they? Is Christianity mostly a cultural institution, or do they really know Jesus? It is not my intention to belittle the Orthodox Church in Moldova. But it makes me wonder: a country that forces all religious groups to register with the state doesn’t help me to believe that 93% of its citizens are filled with the Spirit. Many times religious people find their hope of salvation in the keeping of tradition, the confessional, or prayers to saints in a candle-lit room. What they don’t understand is that Grace is calling out to them. Jesus wants to set them free from legalism and a cold, unevangelical faith. I don’t know how many visits I have had to this blog by people in Moldova, but it can’t be more than a few. Yet, there has been at least one, so just pray that this site might spark a revival in such a poor and thirsty land. And while you are praying, pray for the economic situation in Moldova. Faith? Just Go to the Store. As a child, especially as a teenager, I remember being told to shut the door of the fridge. For five minutes I would just stand there staring. Who needs an air conditioner when you have a picky, hungry, spoiled teenager? Adults do the same thing. Wow! What a blessing we take for granted! “Just go to the store,” she says. 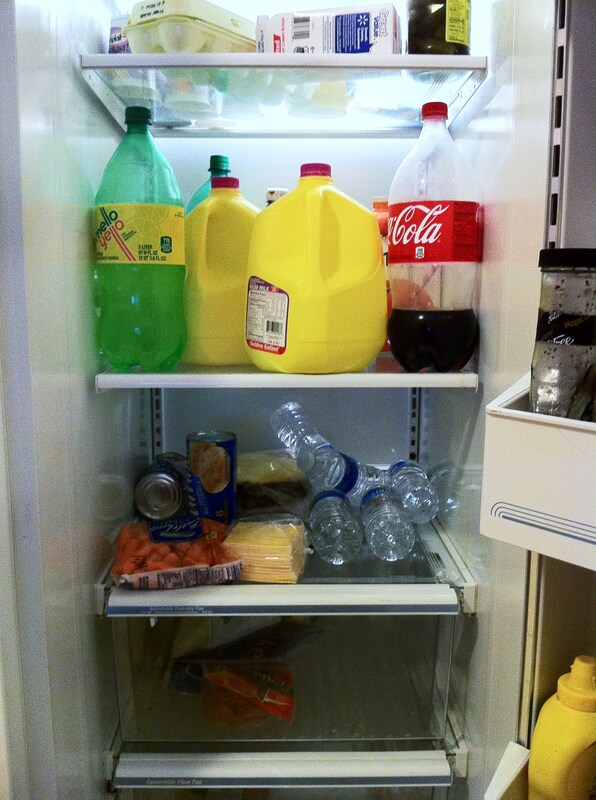 No food? No problem – JUST go to the store. Somewhere a cow had given its life and was waiting for me to come pick out its remains from a cooler. I go to the store, just like my wife suggested, and found everything we needed to grill some wonderful, 20% fat-filled, high-cholesterol comfort burgers on our Weber grill (cheap little one). On top of that, I picked up an onion, some buns, and a fresh, ripe tomato. Problem solved. No faith required. “God will provide.” Easy to say – hard to live. In the early 90’s, when Romania was just beginning its walk with freedom, food was still a scarce commodity. Yet, whenever a guest like me would enter a home, the hosts would bring out the very best they had – ALL of it – and prepare a meal fit for, well, an American. They really couldn’t afford it. In many cases, there was literally nothing left for the next day. So, in an effort to stop the madness, I tried to talk some sense into these over-hospitable people. That’s what I call faith! We just go to the store.